6th Sense Weight Sensor, Steam Technology, 3D Crisp Technology, European Crisp Pan Accessory, Oven with True Forced Air, Jet Start. The Unique "6th Sense Weight Sensor Technology" enables the Oven to intelligently measure the weight of food class, and automatically sets the cooking method,time and power needed, just in one touch.As a result,your cooking is done with perfect balance of taste and nutrition. "Steam Technology" steams food by automatically setting the cooking method,time and power by means of controlled gentle simmering process.With this feature you get perfectly steamed food,retained with nutritions,minerals and taste,quickly. 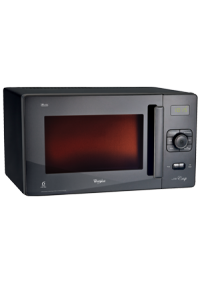 "3D Crisp Technology" uses 2 entry points through which the microwaves enter the cavity. These twin entry points get activated along with the grill and European Crisp Pan, enabling the oven to heat up from 0 to 210 degrees in just 2 minutes.This provides you with the best top and bottom crisping and browning results. 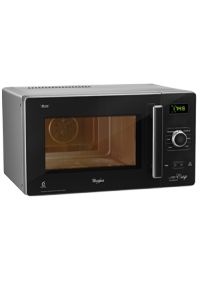 This microwave oven has a preset temperature of 175 degrees, along with "True Forced Air" feature which provides ideal baking conditions similar to Ovens.Using the" Jet Start Mode" , With one touch,you can quickly reheat food with high water content such as clear soups,coffee or tea .Jet Start mode automatically starts with the maximum power level and the cooking time is set to 30 seconds. Accessories European Crisp Pan, High & Low Grill Racks, Turntable Support, User Manual, Unique Square and Flat shaped Boil & Steam International Steam Accessory, Special Crisp Pan Handle. To Recieve updates and possible rewards for Whirlpool Jet Cuisine Nutritech (29 Ltr) please sign in. To Recieve updates and possible rewards for Microwave please sign in.